Great cereal.... more than just another Raisin Bran rip-off. The flakes have a familiar multi-grain flavor, maybe a bit sweeter than you'd expect. The oat clusters are much smaller than the oat clusters found in other cereals, but they are very flavorful. They don't add any crunch to the cereal, but they do add substance and character. There's definite undertones of brown sugar and cinnamon in this cereal. The overall flavor is complex enough to entertain an adult mouth, but also close enough to traditional Raisin Bran type cereals to slip it by kids who like that kind of thing. As for the fiber in this Fiber One cereal, each serving has 43% of your daily suggested fiber requirement. That's 11 grams per serving. The top three ingredients on the side panel are whole grain wheat, raisins and sugar. I liked this cereal a lot. It didn't feel like a healthy cereal. It's just seemed like a very satisfying breakfast. 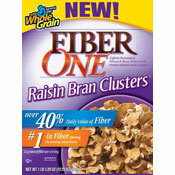 What do you think of Fiber One Raisin Bran Clusters? Have not been able to buy this in any grocery store for at least a year now. Shame, it was one of my favorites. Also, same goes for the almond variety of Fiber One... just honey clusters and original (yuk). I can't find it in any stores any more! I happened to stumble upon this cereal at my neighborhood supermarket, it was on sale for two bucks off. Usually I eat regular r.b. so I decided to give it a try... it is terrific! Since its on sale I bought 6 more boxes and I'm going to get 4 more! Don't kid yourself ppl. I work for the fiber one factory and there is no difference in the taste. Just a different texture to the cereal. We have been upgraded with new technology in our production company and it has caused our cereal to change its look, not its taste. When you really think about those factors, sit down take another spoon of fiber one and you'll realize it has the same beautiful replenishing taste. You guys are complaining too, yay. I just googled this after I bought my first box of Fiber one that didn't taste right. I don't know why they changed the recipe but I don't like it. I used to eat fiber one every day as it was my favorite. I too am looking for a new cereal. I liked the old F1 flakes - more bran with a brown sugar taste. Now they're like stale corn flakes! They have changed the recipe. It must be cheaper to produce. My husband doesn't like the new flakes. I actually like them better. I don't like the fact that General Mills is not admitting that they changed it. Even the picture of the cereal looks different on the newer boxes. Soo... they knew they needed new pictures but they didn't know they changed it???? I also noticed that the flakes are different and not as good. I've been eating this every day for years, but I'm looking for a new cereal now. Apparently they have changed the recipe since these reviews. I too loved the cereal, but they totally changed it this month (July 2010) and it is terrible. 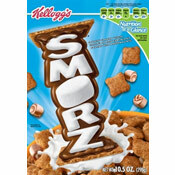 Bland, without that distinctive molasses flavor it had... and the flakes are now puffed up like a Special K flake with no flavor at all. Hey Fiber One... can you say Coke Classic?? Tastes very good. I could go for a wee bit less sugar, but I mean the high amount of fiber in it is still great, and it has good carbs in it (whole grain). I lost 27 pounds in 1 month with this cereal. I ate 5 small meals a day; and ate this cereal at each meal.... for the entire month. I mixed it up a little bit. Sometimes I would use strawberries. Sometimes I added banana. One time I even added tofu. I lost 27 lbs in 1 month, and my new boyfriend thinks I look great. I generally eat cereal without milk, so it really needs to stand on its own. This one does! I love the taste, the texture AND the nutrition label. However, with as much fiber as it has, it should come with a warning for those that aren't used to that much fiber. If you eat 2 servings or more at a sitting, you could spend some uncomfortable time "offloading" it, as it were. If you're used to lots of fiber, this cereal is great! Love this cereal, whoever while eating it this morning I choked on something sharp in it. Blood was coming up as I gagged. My doctor looked down my throat and could see that it had been nicked with something, but what ever it was has gone down, but left me with a wicked sore throat. Crazy enough, I still crave the cereal. Its that good. But I think I'll buy another box. I loved this cereal. I thought that the flakes had a more "toasted" taste. I've been a Raisin Bran fan all my life - and this just might make me switch.